This we know: being in close proximity to someone increases the chances of attraction. And who do we spend more time around than our coworkers? For New York career coach Carlota Zimmerman, this finding isn’t surprising. “Where do you spend the majority of your lifetime? The office. Why do so many people joke about having an ‘office wife’ or ‘office husband?’ Because of the significant time, energy and emotion invested in the workplace,” she says. Even if you started your first or most recent gig in a relationship or already married, at least one point in your career, it’s likely you’ll witness a romance of some sort…and hey, maybe even have feelings for someone yourself. Our better angels may tell us to ignore it, but emotions can be unruly. Colleagues will judge an office romance or affair based on how blatant the couple is during the workday. Zimmerman warns that an affair can trigger emotions in others that might be difficult to express. “An office romance can impact other employees, by stoking their jealousy, or disgust, or amusement. Office life is, in many ways, very reminiscent of junior high; when your best friend gets a boyfriend or girlfriend, suddenly they don’t want to hang out as much, or if they do, they just want to talk about their crush. It can be tedious,” she explains. Does it impact morale? Yes and no, Zimmerman says. What it boils down to is how much it directly impacts your ability to finish your work, meet deadlines, exceed in your career and have a harmonious workplace experience. While sometimes you should speak your truth, other times, experts recommend keeping it quiet to save face. Here are the best ideas for a response. Unless you’re in at a startup that’s still in it’s infancy, nearly every company has a code of conduct. You’ll find sexual harassment information, office rules and safety regulations, and what executives and leaders have decided about extra-curricular behavior for employees and managers. What’s in clear black-and-white can help you determine your best course of action, according to workplace expert and industrial-organizational psychology practitioner Amy Cooper Hakim. “As long as company policy permits such a relationship, then it is truly none of your business,” she shares. The only caveat here, Hakim explains is if the code of conduct isn’t being respected in an professional, adult manner. Then, you have the right to voice your concern. This is especially true if your job is at stake. At most companies, how appropriate an affair or relationship may be comes down to one thing: does one person have any direct responsibility for the other person’s career? An executive dating a just-out-of-college intern, or a manager dating someone they evaluate daily is another story, Zimmerman says. Then the office romance infringes on issues of power and money, and quickly lead to chaos. In addition, it’s not uncommon that someone who is having an office romance can become a “favorite” and lead to bad team dynamics, or receive promotions they’re not entirely qualified for. In addition, anyone who crosses the favorite can feel punished in their career paths. That kind of toxic “protection” can become a major problem, and it’s what gives office relationships a bad name. That’s when you should try to say something, because the impact on others can be destructive. Just like you’d extend an olive branch to a friend to clean up their act before you bad-talked them to another friend, Zimmerman says talking to the couple directly before you go to HR is a kind-hearted move. “You have a responsibility to politely but clearly make it clear to the parties involved, that they need to take it down a notch. I would probably speak first to the person whom you have some kind of friendly relationship. In many cases, just the realization that they aren’t as slick as they think, and that everyone knows is enough to throw a damper on things,” she suggests. If they blow you off? Or it keeps getting worse? That’s when you speak to a professional, just make sure you come prepared with proof, including specific receipts, dates and examples to back up your reasons for being upset or concerned. Zimmerman warns that if the affair is merely bugging you, and not really changing your workflow, it’s better to keep your thoughts to yourself. Even if you think it’s clear they have a little somethin’ somethin’ going on, assumptions can be dangerous—not only to their reputation but yours, too. She gives the personal example of when she was ending her tenure in network news. She was very close with a colleague — and perhaps, even a little flirty — but they never extended the relationship past the office. Though her experience was on the extreme case, staying out of the chaos is usually the best bet, especially if your resume isn’t in jeopardy. “Remember that you don’t need to be friends with everyone at work, but you do need to have a professional relationship. If you are not comfortable with the office romance, make sure to still remain polite and respectful when interacting with the couple at work,” Hakim says. 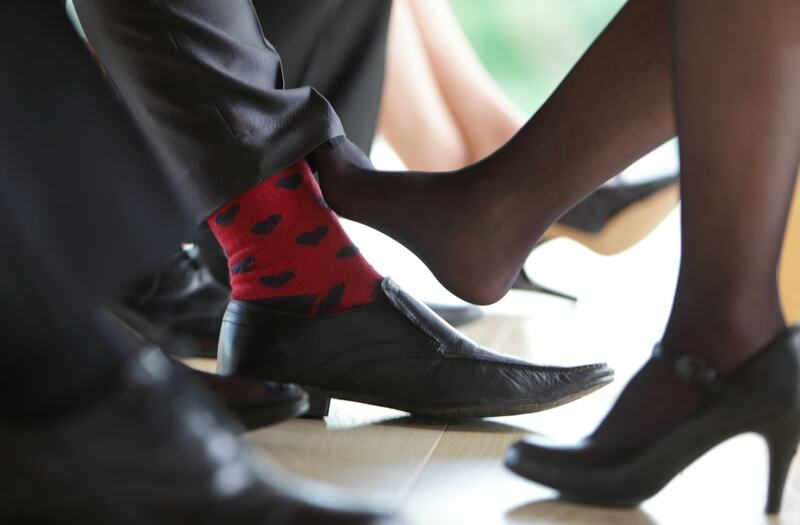 This article More than half of Americans have had an affair at work. Here’s what to do when you find out about one. appeared first on Ladders.